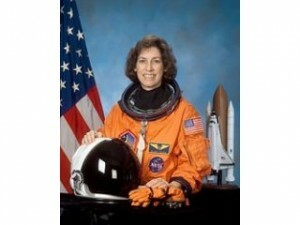 Ellen Ochoa: First Female American-Hispanic in Space! Reach for the stars and let nothing limit your potential. This motto is truly reflected in our amazing space representative, Ellen Ochoa. As an engineer, inventor, physicist and astronaut, she has demonstrated to young and old alike that success can happen with dreams, training and hard work. Watch the clip, then read our interview! 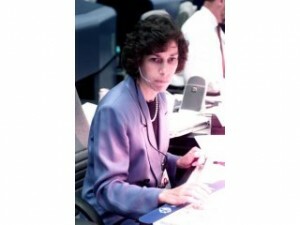 Dr. Ellen Ochoa is the Deputy Director of the Johnson Space Center. She has been an Astronaut on board four NASA Space Shuttle flights, and she’s also an inventor. She became an astronaut in 1991. In April, 1993, Ellen became the first Hispanic-American woman in space as a mission specialist aboard the Space Shuttle Discovery. She even released a satellite into space using a robotic arm! After spending many years working on the development of the International Space Station, in 1999 Ellen flew aboard the Discovery, on the first Space Shuttle to actually dock with the Space Station. Ellen operated a robot arm that helped transfer four tons of supplies to be used by the crew of the Space Station. After a total of 4 space shuttle missions, she became Deputy Director of flight crew operations at Johnson Space Center in 2002 and director of flight crew operations in September of 2006. She was appointed Deputy Director of Johnson Space Center in September 2007. She has received numerous awards including the NASA awards of Distinguished Service Medal, Exceptional Service Medal, Outstanding leadership Medal, and four Space Flight Medals. She also has received the Harvard Foundation Science Award, Women in Aerospace Outstanding Achievement Award, first woman to receive the Engineer of the Year award by the Hispanic Engineer National Achievement Awards Conference, The Hispanic Engineer Albert Baez Award for Outstanding Technical Contribution to Humanity and numerous others. She also has two schools named after her in Pasco, Washington and Cudahy, California. Back On Earth... Working to keep fellow astronauts safe. AK: Describe your responsibilities as Deputy Director of the Johnson Space Center. EO: [I am] the Director and I manage the Center that is in charge of all of NASA’s human space flight programs: the Space Shuttle, the International Space Station, and the Constellation Program, which is developing new vehicles and systems to explore beyond earth’s orbit – the Moon, Mars, and other destinations. The people who work at Johnson Space Center include engineers and scientists, astronauts, pilots, flight controllers and flight directors who work in Mission Control, and many other people who help us accomplish our mission by taking care of financial systems, obtaining products and services through contracts, providing legal advice, hiring and training employees, providing information technology services, and running our facilities. We have many specialized facilities including Mission Control, a huge indoor pool that’s 200 ft x 100 ft x 40 feet deep used for training astronauts, other training facilities, a large vacuum chamber used for testing spacecraft and lots of other testing facilities, and about 40 aircraft including the T-38 jets that astronauts train in, the Shuttle training aircraft where astronauts learn to land the Shuttle, and the 747 that carries the Shuttle on its back. AK: Did you have any significant role models or mentors growing up that helped guide you toward your successful career? EO: My mother had the biggest influence on my life. She always had a love of learning, and encouraged my 4 siblings and me to take advantage of educational opportunities including college and graduate school. While she didn’t have an opportunity to go to college when she was young, she began to take one college class at a time as she was raising 5 kids, and eventually graduated two years after I did! I have also had informal mentors all throughout my schooling and career who encouraged me to take the next step and helped provide me with confidence in my ability to set and reach goals. AK: What qualities do you think helped get you selected as an astronaut on an actual launch? EO: NASA looks for people who have a solid technical foundation, who learn quickly and are interested in many things, and who value the importance of teamwork. I think that my doctorate in engineering, my research publications and patents in my early career at the time I was applying to be an astronaut, my interest in music and other activities, and the pilot’s license I had earned were all factors in my selection as an astronaut. AK: Describe what training is like for NASA astronauts preparing for a space mission. EO: After being selected, astronaut candidates spend about a year in full-time basic training, learning about the systems of the spacecraft or spacecrafts they will fly. They also fly in high performance aircraft, go through scuba training (to assist in training for space walks), and get an introduction to many other topics including learning what work goes on at each NASA Center. After that, they are assigned technical jobs that support the development and/or operations of human space flights, and begin training in specific skills like using the robotic arm, doing space walks, or flying spacecraft for rendezvous, docking, and landing. Once an astronaut is assigned to a particular mission, the training may take anywhere from a year for a space shuttle mission, to several years for a several-month expedition on the International Space Station. In the latter case, astronauts spend the majority of their time training around the world at sites in Russia, Japan, Canada, and Europe. AK: Can you describe some of the unique things about living in space – eating, sleeping, brushing your teeth, bathing, floating in zero gravity, etc.? What does it feel like during takeoff and landing? What was the most surprising experience that you did not expect that happened to you on your missions? EO: It’s really fun and interesting to live and work in microgravity. Some things are a lot easier (moving items around that weigh a lot on Earth, or putting your pants on two legs at a time! ), some things are a lot harder (performing any job that requires a lot of tools and materials that you have to keep track of), and some things are just plain fun (eating m&m’s or goldfish crackers floating in front of you, brushing your teeth while doing a flip, looking out the window at the Earth). In the Shuttle, the launch takes about eight and a half minutes, and the acceleration forces and vibration vary quite a bit during that time. The solid rockets provide most of the thrust in the first two minutes, and cause a lot of vibration and noise. Once they drop away, the liquid engines provide a much smoother ride. In both phases, we are accelerated up to 3 g’s which feels like someone who weighs three times as much as you is sitting on your chest. And then at main engine cut-off, you immediately become weightless, so it’s quite a transition! In contrast, the entry and landing are quite smooth, with just a little bit of turbulence as you slow down from being supersonic to subsonic. Landing was so smooth that I often wasn’t even able to feel the wheels touch down on the runway; however, I felt very heavy, coming back to a one-g environment after being weightless for several days. AK: What are the challenges of operating the robotic arm in space? EO: The robotic arm flies very well, so it’s really fun and interesting to use. One challenge is that we need to train for situations in which one or more parts aren’t working, so we need to learn to move it joint by joint, even though we generally won’t have to use it that way in space. Another challenge, particularly for the space station arm, is that there is no window view of the arm, so we need to rely on camera views; often, we don’t have a good view of the whole arm and can’t really see how close parts of it may be to structure. So we need to keep changing camera views, be very familiar with how the arm moves, and be very careful of its position at all times. AK: How has traveling in space and your involvement with the space program changed your perspective on life on Earth? EO: : I feel really, really [privileged] to have had the amazing experience of traveling in space – and to work at a place where so many talented and dedicated people work together to accomplish incredible missions. I value teamwork, and striving toward challenging goals. The chance to view our planet from space has shown me how beautiful and fragile it is. 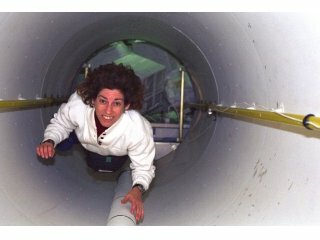 AK: How has the field and opportunities for women astronauts changed in the past 20 years? EO: I was fortunate that women had been members of the astronaut corps for a dozen years when I joined. The astronaut corps has been about 20% women during the time I’ve been at NASA – a higher percentage than women who choose engineering or piloting as their careers but nevertheless a percentage that will hopefully grow larger as more women choose science and engineering fields. In the last 20 years, we’ve seen the first woman pilot and command a Space Shuttle, and the first woman command an International Space Station expedition. There’s no job in the astronaut corps that women haven’t done and continue to do. AK: How do you think the space station and the space program will impact the future? What are NASA’s plans for future space missions? AK: You are an inventor as well. Can you describe your inventions and what they are used for? How did you come up with the ideas for your invention? EO: Before I was selected as an astronaut, I was a research engineer in the field of optical processing. I used lasers, holograms, and other optical equipment to obtain information from images. One of my inventions was a product of my doctoral research, using a type of material called photorefractive crystals as a real-time holographic device. By focusing light beams carrying information in certain ways, you could use these crystals to identify defects in objects that had repeating structure. Other optical systems that I was a co-inventor on used optical systems to pick out specific objects in images, or to remove noise in images. AK: If you could give advice to a child interested in becoming an astronaut, what would it be? follow your dreams and it doesn’t matter if people don’t believe in you its if you are confident. do what your heart desires because its what you want to do for the rest of your life. keep trying never give up cause everybody has potential, every one including you. don’t let anyone get in your way!!!!! do it if it makes you happy!!!!! !